“Walking simulator” is a term used to deride games like Gone Home, Dear Esther, and Firewatch—all critically acclaimed, first-person experiences that get slammed by some gaming aficionados for focusing on storytelling over complex interactions. 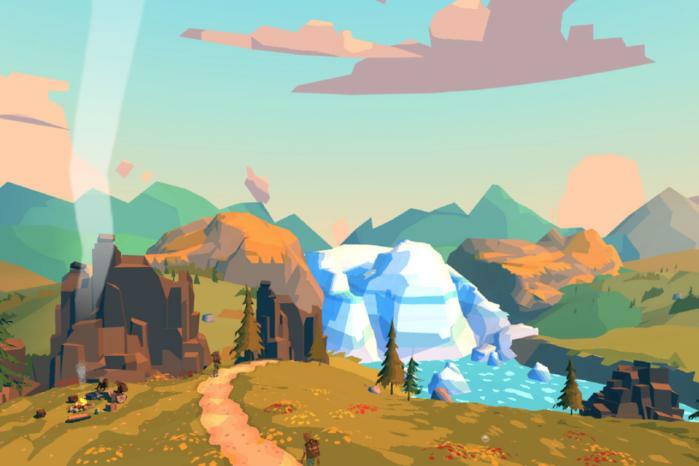 The Trail isn’t exactly like those games, but it sure is all about walking: you’ll stroll ahead on a fixed path from one camp to the next, attempting to survive the trek and ultimately make it to the big city. It’s not the most precise aesthetic, but it provides some pleasing vistas. 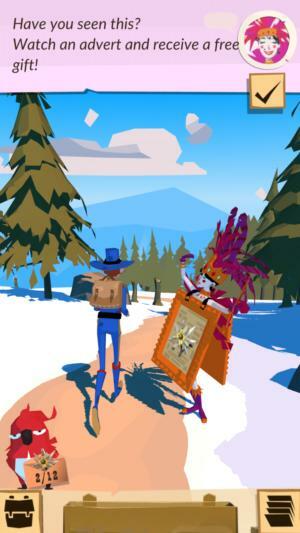 It’s the latest mobile adventure from 22Cans, the studio formed by legendary game designer Peter Molyneux (Fable, Populous), and it certainly has an intriguing premise. But like a lot of the big claims Molyneux has famously made over the years, The Trail’s initial promise doesn’t pay off as much as expected. And quite like a real hike, it can be plenty exhausting too. 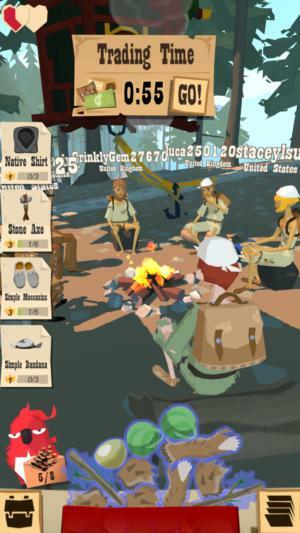 The Trail sort of feels like a super-streamlined, one-handed take on edutainment classic The Oregon Trail, but it also owes a lot to games like Minecraft and Don’t Starve. Your goal is not only to make it to the promised end point of Eden Falls, the city at the end of the path, but also to collect resources and use them to craft tools, clothes, and other items. Trading Time! You’ll link up with other players and can swap spare items. That’s really the meat of the game, especially since movement is handled automatically and you can’t deviate from the route; you can only set your character’s walking speed. As you wander from camp to camp, you’ll see plenty of items pop up alongside the tail: apples, acorns, sticks, leather, rocks, and more. Also, there are trees to cut down once you have an axe, and animals to hunt once you have a weapon (like a slingshot). Both offer further resources to collect and then try to shove into your tiny knapsack. Once you make it to a camp, you can use those items to begin crafting by dragging compatible items onto a grid and following the recipes. 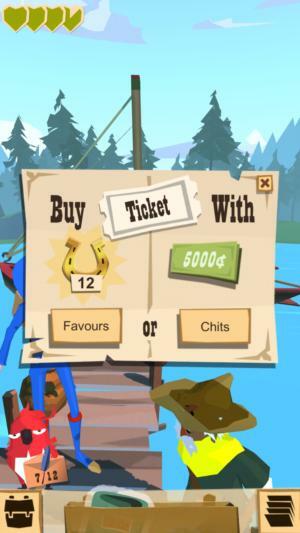 Creating better tools and clothes can give you a leg up on the trail, or if you have duplicate items, you can sell them off during Trading Time at camp to earn extra Chits (coins) from other players. You’ll inch closer and closer to Eden Falls in the early hours of the game, and in fact, it was the one thing that kept me motivated. 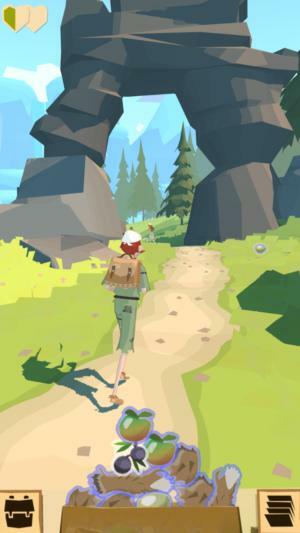 The Trail is beautiful, with an alluringly low-polygon look that gives nature an appropriately rugged look, but the cycle of walking, crafting, and trading turns awfully tedious after a while. Still, I figured that all of that build-up, all of those hours spent doing the same thing over and over again, would surely be rewarded once I reached the city. Right? That’s my little home. If I want to improve it or the town, my hero must walk and walk and walk. Didn’t I do that already? Nope. Usually, this section focuses primarily on a free-to-play game’s monetization strategy, but the biggest catch of The Trail is its lack of payoff. Once I got to the city, which is shared with other online players, I bought a plot of land and was excited to explore all that my new home had to offer. Unfortunately, it was very little, and the game simply wanted me to go back out to gather even more resources to decorate and upgrade my home, and help build the city. It was a ruse. There is no destination. The walking never ends. Building up a community with other players sounds potentially interesting, but everything is locked from the start, including the ability to establish a bank, open an explorers’ guild for finding gold from walking, and even the ability to chat with fellow residents. You’ll buy those with communal gold earned by amassing resources… or by buying it. And then you have to wait for a timer to tick down. Meanwhile, some listed features aren’t even in the game yet, such as the ability to elect a mayor. Tolls get pretty expensive as the game progresses. If you don’t spend money, you’d better be diligent about crafting and trading. In time, with enough collaborative persistence, a thriving city could be an intriguing hook, and the game mentions the ability to find a mate and start a family, as well. But right now, the idea of being sent back out for hours and hours of grinding is a total nonstarter for me. I’ve put in a few futile attempts to grab more resources since then, but I can’t muster up the interest or enthusiasm to keep at it. Not only does the sheer repetition of the walking routine kill the fun after the first few hours, but so too does spending money. After a few days of playing, before arriving at the city, I dropped $8 to snag the New Explorer Offer: a bundle of goodies that included a Ranger’s Hat for extra stamina, Ranger’s Trousers for further item storage, better tools, 5,000 chits, and 88 Favours used to purchase additional perks and special items. Right away, I used some of those Favours to snag additional gear; further Favours are sold for between $5 and $100 per pack. After that, I was set. No longer did I need to worry about moment-to-moment survival or generating enough money to pay the occasional ferry toll. It made the remaining jaunt to Eden Falls move a lot faster, but it also stripped out nearly all of the necessary gameplay from the experience. When I got to the city and realized I’d just need to go back to scavenging resources or spend more money on shortcuts, I couldn’t convince myself to do either. I was spent. Every so often, you can watch a video ad for a free item, or watch one to double your earned currency during trading. It’s worth your 30 seconds for the free boost. I’m not blaming the in-app purchases, however: it’s the very limited and repeated resource-gathering grind that ultimately wore me down, and being able to spend a little money to circumvent that provided a welcome break. And if there hadn’t been so much build-up about getting to Eden Falls, where the game ultimately just changed the prompt and tossed me back out onto the trails, then maybe I would have felt more inspired to keep playing. Molyneux has an unfortunate history of over-promising features for games and then under-delivering for whatever reason, and that has seemed true with 22Cans’ games so far. The first game, Curiosity – What’s Inside the Cube?, was a social experiment that had players tapping loads of tiny boxes to try and uncover a secret hidden within. 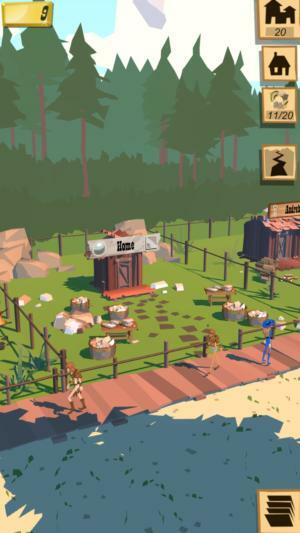 Molyneux said that the ultimate reward for one player would be “life-changingly amazing by any definition”—but it was just a cameo in the studio’s next game, Godus. And they still haven’t followed through on that promised reward. 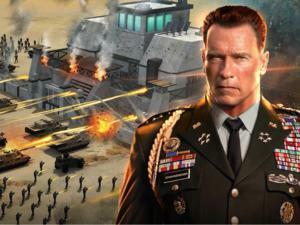 Godus is a whole ‘nother can of worms. 22Cans raised more than $700,000 via Kickstarter to make the game, but what they released was much smaller in scope than what was described in the crowdfunding campaign. Even so, Godus had its fans—one of our You Should Play columnists included—but it fell well short of what backers and would-be fans expected. The Trail seems to continue this trend. 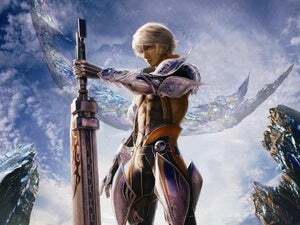 It’s not a bait-and-switch, since there were no explicit promises about what the second stage of the game would include, but the initial hours of walking and scavenging seem to tease out a bigger purpose ahead. And it’s just not there, at least not at this stage. Premium games like Minecraft, Don’t Starve, and Crashlands thrive because they provide a sense of exploration, and because the resources needed for crafting and survival aren’t bound by an in-game business model: you can’t pay money for shortcuts or watch video ads for free items in those games. They feel complete and balanced, whereas The Trail offers minimal interaction and then tries to get you to spend money to snag what you need. Whatever sense of wonder that is conveyed by the dreamy graphics is quickly quelled as a result.